Copywriter | Portfolio | Marketing Magazines . This client produces quarterly, 4-page newsletters for its customers as a major part of its marketing. The newsletters feature new model and showroom services details and are written to be informative, friendly, and, above all, to put customers in a "buying" frame of mind. Potential and actual customers of several car showrooms in London. It’s Spring and we are blooming! That’s right! 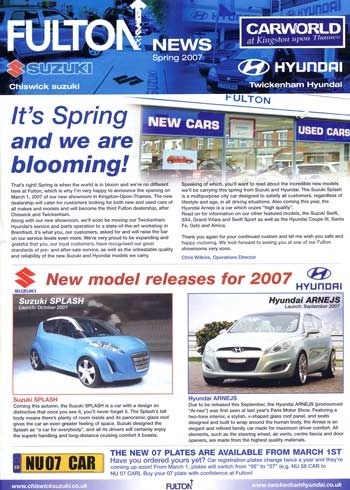 Spring is when the world is in bloom and we’re no different here at Fulton, which is why I’m very happy to announce the opening on March 1, 2007 of our new showroom in Kingston-Upon-Thames. The new dealership will cater for customers looking for both new and used cars of all makes and models and will become the third Fulton dealership, after Chiswick and Twickenham. Along with our new showroom, we’ll soon be moving our Twickenham Hyundai’s service and parts operation to a state-of-the-art workshop in Brentford. It’s what you, our customers, asked for and will take raise the bar on our service levels even more. We’re very proud to be expanding and grateful that you, our loyal customers, have recognised our great standards of pre- and after-sale service, as well as the unbeatable quality and reliability of the new Suzuki and Hyundai models we carry.